Goodreads Summary: Evelyn has no interest in marriage and even the dashing Mr. Kent can’t inspire her to give in to society’s expectations. She’d much rather assist her beloved sister Rose in her radical quest to become a doctor. Then she meets Sebastian Braddock. The reclusive gentleman is vexing, annoyingly attractive, and quite possibly mad—and his interest in Rose is galling. So when Rose disappears, Sebastian is immediately suspect. Why I'm Waiting For It: Secrets? Lies? Kidnappers? Count me in! Definitely looking forward to this one because it sounds amazing and the cover! Hoping this one has tons of action and suspense and doesn't turn out like Venom by Fiona Paul (which was a total disaster, I expected so much more). 2016 please come sooner! 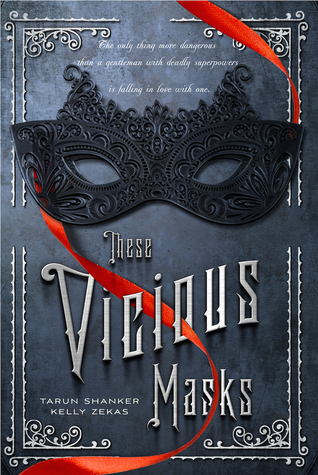 These Vicious Masks hits shelves Feburary 9, 2016 from Swoon Reads! How cool! I hope you'll enjoy this! I love Swoon Reads and the way they go about doing things! I helped vote on the covers that they had for this book and this one was one of the best ones! This is on my TBR for sure! Great pick! This sounds SO GOOD! Secrets, lies, kidnapping and mystery have me hooked as well! And I love Swoon reads, too. Great pick! Woah, this one sounds so good! Swoon Reads always releases the best books.